Justin Houston was racking up the sacks -- including this one of Philip Rivers -- until he suffered a gruesome elbow injury that cost Houston five games but now has healed. KANSAS CITY, Mo. 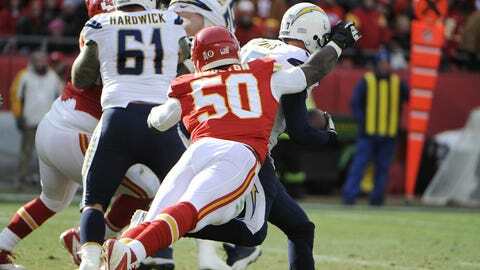 — It has been over five weeks since we saw arguably the Chiefs’ most dangerous defensive weapon — linebacker Justin Houston — on the field. Houston finally is expected back for Saturday’s playoff game at Indianapolis, and players and coaches from both sides anxiously wait to see the impact that will have on the Chiefs’ defense. Houston was soaring toward a monster season when a gruesome elbow injury in the Nov. 24 Chargers game at Arrowhead Stadium — his left elbow bent in a direction elbows aren’t designed to bend — shelved him for the final five weeks of the season. Houston was forced to sit and watch his team struggle down the stretch. "It was very tough knowing if you were out there you could make a difference," Houston said. "Just sitting back watching it on TV and not being with the team, that’s very tough. "I love being around my teammates. I feel like we’re a family, so anytime you’re with your family you feel comfortable, you feel like you’re at home and you’re enjoying being with them. Not being with them as much as I wanted to was tough." Despite the injury, Houston registered a career-high 11 sacks this season. But Houston is not concerned about personal goals now. "I know everyone has their own goals, but the team goals are more important and we’re still on that journey," he said. "I think it’s everybody’s mindset. We want to win. Everybody knows it’s playoff time. Win or go home. Everybody’s mindset is we are not ready to go home." A healthy Houston and a healthy Tamba Hali, who is battling a knee sprain, will give the Chiefs that pass-rushing tandem they have sorely missed the past five weeks. It’s a pass-rushing combo that tends to make everyone around them play better. "You got Pro Bowl guys, Tamba and Justin, both on the outside and big (tackle Dontari) Poe in the middle — they are elite players in this league," middle linebacker Derrick Johnson said. "You have those guys working up front and that is wonderful. I can just sit back and make plays. It’s great." The Colts, obviously, are especially concerned about having to block Houston and Hali. 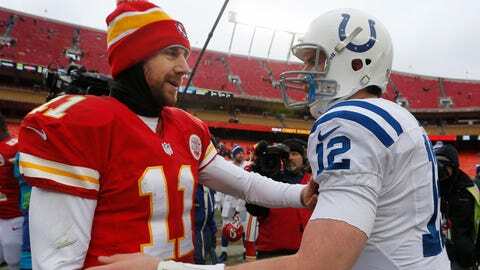 "Certainly, we know that both of those guys have 11 sacks apiece," Colts coach Chuck Pagano said in a conference call. "With Tamba on one side and Justin on the other, it’s a great duo, both in the run game and certainly in trying to protect your quarterback. Our tackles have played well for the most part all season, but it will be a huge challenge for both of those guys to get those guys blocked." Pagano, too, is aware that Houston’s presence, along with Hali, creates matchup problems that allow other Chiefs defenders to excel. "I mean, you just look at the sack totals for the season and they’re close to 50 as a team," Pagano said. "(Defensive coordinator) Bob Sutton and those guys do a great job with that defense and that scheme. They get after it. They get you in the third-and-long situations, and they’re fifth in the league, finished fifth in the National Football League on third down (stops). "They’ll bring guys from every level, and there are guys that have sack totals from every level of that defense. They’re blitzing those guys. Derrick (Johnson) is coming inside, (Eric) Berry is coming, whoever. "It makes your focus trying to stop the two main guys, 91 and 50, but you better pay attention to the rest of the crew because they have a bunch of able bodies over there that can get after the quarterback." Still, that synergy on defense seems to have been absent without the presence of the Houston-Hali tandem. "When you have great pass rushers (like Houston and Hali), teams can’t just come in and double one guy," Poe said. "Somebody has to have a one-on-one, and that’s what makes us good. But when one of those guys goes down, it’s not the same." And it hasn’t been. But come Saturday, the Chiefs’ defense should be healthy and rested, and perhaps it will resemble the terrorizing unit it was earlier this season.